Re-union with my old student and his son in Jamaica.It's wonderful time. 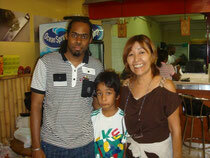 He was winner ' The third Japanese speech contest' in Jamaica 10 year's ago. When he got trophy he was single man, and now he has 8 years old son! Time flies. He is English teacher in Japan and his son, Akimu is Japanese teacher of dady now! !